All interested individuals are requested to send a letter of interest c/o The Selectmen's Office, Memorial Building, 25 South St., Bridgewater, MA 02324 by September 22, 2008 or by e-mail to lsullivan@bridgewaterma.org. Additionally, the Parkland Stewardship Council is currently looking for Lead Stewards for the following parks: Titicut and Wyman Meadows. These are volunteer positions to oversee the parks. Please contact lkeane@bridgewaterma.org if interested. SHINE counselors are available to help Bridgewater senior citizens with insurance questions. The counselors are volunteers who are trained and certified by the Executive Office of Elder Affairs to explain many areas of health insurance, including Medicare, Medigap, Medicare HMOs, Mass Health (Medicaid), prescription drug programs and other health care assistance. By appointment only, call 508-697-0929. A concert performance by Berklee College of Music student Josh Freitas will take place on Tuesday, August 26th from 7-8PM. The concert will take place at the Handi Kids camp and will serve as a fundraiser for Handi Kids. A suggested donation of $5 is asked for this amazing opportunity to hear a local musician and help out a great organization all at the same time. Click here to view the warrant. The Budget: What To Do? The poll results are in and Bridgewater residents have spoken about what their hopes are for the budget at the Special Town Meeting to be held next Monday night. It will be certainly interesting to see how many people will come out for the Special Town Meeting and whether or not the actual outcome will match the poll results on Around the Common. 34% think that the budget should be reduced by $508k as requested by the Selectmen. 5% think that there should be no reduction and that we should wait and see about free cash and/or other revenue. The walk will begin and end at Saint Thomas Aquinas Church on Center Street, stopping at other churches along the three mile route. Step off is noon and the walk will be followed by festivities on church grounds till 3:30 p.m.
Money raised will be split between the Council's scholarship program, the Bridgewater Public Library and the Town's food pantry at the Academy Building. Volunteers are needed to help organize, advertise and staff the event. All are welcome regardless of church association, if any. Please contact Maura Chappelle at MauraAnnette410@gmail.com If an interested person does not have access to e-mail they can call (508)697-2008. On Tuesday, August 12, 2008, the Friends of the Bridgewater Public Library held a wine tasting fundraiser at The Wine Palace. Over 200 supporters of the library attended or donated to the fundraiser. Attendees sampled wine served by Donovan, Shelley and others at The Wine Palace in West Bridgewater and tasted food presented by Friends board members and library trustees. A big thank you goes out to everyone who donated time, product and services to the fundraiser, especially The Wine Palace in West Bridgewater for hosting the event and serving the wine. Charles River Wine Company and Trio Wine Company also served the guests. Peterson Farm in Bridgewater and Shy Brothers Farm in Westport helped with food products. And thank you to Cassia from Norton who helped obtain some of the titles from Bookmooch.com, Stephanie Guarino, and Friends of the Bridgewater Public Library for the door prizes. We would also like to thank all of our advertisers including Around the Common, Bridgewater Cable, Bridgewater Independent, Citizens for a Better Bridgewater, The Brockton Enterprise, the Free Bird Times, Joe Gillis Jr., Taunton Gazette and the Town of Bridgewater website. If you missed the event or were not able to attend, please look for upcoming events to support the library. This event and others like it, including Pizza Fest, the membership drive, and the book sales will help the Friends of the Bridgewater Public Library continue their work in assisting the library during difficult budgetary times. Monday, August 18 is the final day to register to vote for the August 25th Special Town Meeting. The town clerk's office will offer extended hours and will be open from 8 a.m. to 8 p.m. Crack sealing is scheduled for Wednesday, August 20, 2008, pending weather conditions. Operations will begin at 7:00 a.m. and continue until approximately 4:00 p.m. The roadway will be open to traffic, although there may be temporary detours throughout the day. Emergency vehicles will have access to South Street at all times. A mulch blended material will be used to cover the crack sealer. Excess cover material will be removed, if necessary, the following day. This crack sealing process is a cost effective method of prolonging the useful lifespan of South Street. Who: Anyone will enjoy this event – bring everyone you know! Admission: Donations accepted at the gate. The Boston Renegades! It’s sure to be a fun day! All funds raised will be distributed to various Bridgewater Community Lions charities potentially including but not limited to: local scholarships, various town services, Association of Blind Citizens, Youth Speech, Mass. Lions Eye Research, and Lions International Peace Poster Contest. Girls Softball & The Granite City Electric Sweepstakes! The Bridgewater Girls Softball program has been officially entered in the Granite City Electric Field of Dreams Sweepstakes. The winning organization will receive a complete sports lighting system for their field! To win, we need your help! Just click on the link below and cast a vote for Bridgewater. Every 1500 votes equates to one entry in the sweepstakes. Please forward this email to everyone you know (anyone anywhere can vote! ), the more votes we get the better our chances for winning! Vote soon as the contest ends on September 12, 2008. Bridgewater-Raynham Regional High School will hold open enrollment August 18-20 from 8 a.m. to noon. All transferring students should show up between these times to enroll and put together their schedules. Bridgewater Youth Soccer will be having a fundraiser at Friendly's Restaurant on Broad Street in Bridgewater on August 13th from 5 – 8 p.m. Dine-in or carry-out to benefit BYSA. There will be a special appearance by a professional soccer player and a mascot! All sign ups will be held at the Recreation Building on Cottage Street. The Selectmen, by a 3-2 split vote, are having a Special Town Meeting to potentially reduce the Bridgewater FY2009 budget. What should be the result of the August 25th STM? Please vote to the left. Pleased be advised, that individuals unknown to the Bridgewater Credit Union have sent out a fraudulent e-mail using our name. They have done this in an attempt to solicit Debit or Credit Card Numbers from members of the Credit Union. This particular email will state that there has been "irregular" activity on your account and "for your protection" you must verify this activity prior to using your card. Please know that this is a Phishing scheme. The Bridgewater Credit Union will never contact you via e-mail or over the phone asking you to provide us with your; credit or debit card numbers, personal identification numbers (PIN), login passwords, or related sensitive personal data. We warn our members to never give out such personal information in answer to email or telephone inquires. Our member services department, telephone call center, and each branch location have been notified of this fraudulent e-mail. If you have received and responded to an email of this nature please contact us immediately at 800-897-0343. 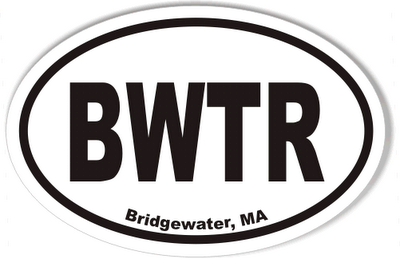 The popular BWTR stickers you have seen around town recently are still for sale! This month, all proceeds from the sale of the BWTR stickers will go to the Frances F. Morast Walk to Beat Ovarian Cancer. This 3 mile walk to be held at the Williams Middle School on September 18, 2008 will have a portion of the proceeds also go to the BR Scholarship Fund in honor of Frances Morast. The Bridgewater Business Association's Autumn Fest 2008 will be held on Saturday, September 27th from 10AM to 4PM. Autumn Fest takes place on the lawn in front of Boyden Hall on the Bridgewater State College campus. The annual event will feature music, food, craft vendors, demonstrations, local civic organizations, baby animals and more! Vendor applications can be obtained by clicking here. For more information or if you have questions about Autumn Fest, please contact Pam Conant at The Community Bank at 508-697-8800 or by email by clicking here. In last week's poll, Bridgewater residents overwhelmingly showed support for the planned sports complex on Elm Street. Again, for more information about the company and the planned project, please click here.